Multiplication may seem like a piece of cake, but how confident are you when it comes to multiplying decimal numbers? What happens when these decimal numbers are in the negative? 'Two Negatives' is a free and printable multiplication worksheet to help you master your multiplication skills. 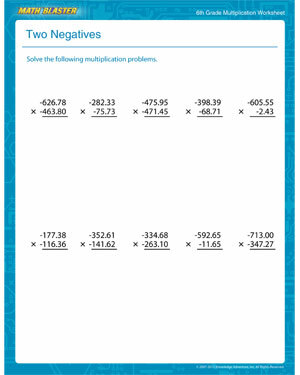 And, what's more, you get to practice concepts related to decimals, negative numbers, and multiplication, all in one go!